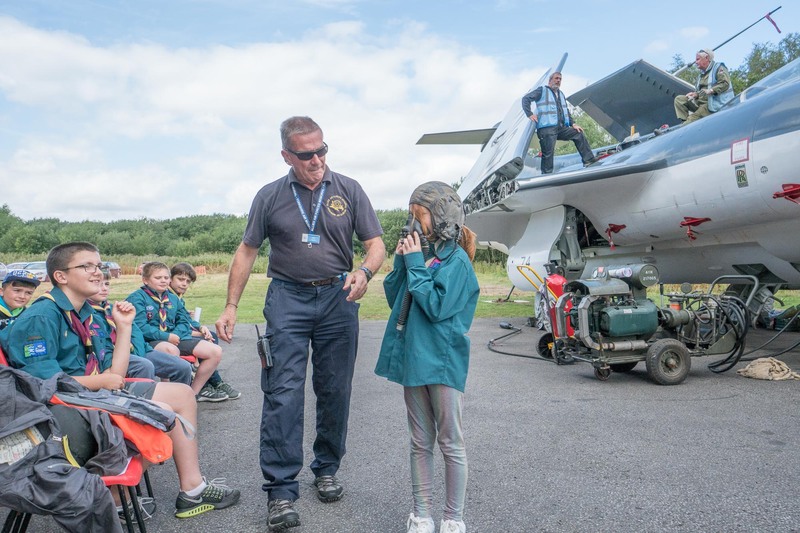 This August saw the Museum team up with The Royal Air Force and The Scouts to deliver a great day’s activities to enable young Scouts to attain a special RAF100 Air Researcher Activity Badge. The Museum was proud to be selected as one of the venues across the UK, together with other aviation museums including the Shuttleworth Collection. 130 scouts and 48 leaders arrived at the Museum to complete a set of activities relating to a selected aircraft in order to earn their badge. These included building a model aircraft, attending a presentation by a museum guide on the chosen aircraft, completing the Museum’s new RAF100 trail, all taking the children around the museum before presenting their findings on a poster. The Museum’s learning team planned each activity session for the scouts which all took place within our spacious memorial Hangar under the watchful eye of our Halifax Friday the 13th throughout the day. Meanwhile, across the grounds of the Museum, our team of Guides and the team from Nimrod XV250 were busy delivering talks and tours around the Museum’s aircraft collection, including SE5a, the Halifax, the Dakota, the Buccaneer and the Nimrod.